The History and Essence of North Indian Classical Music. 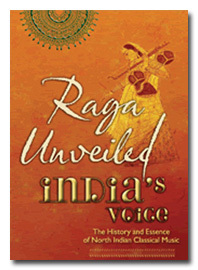 Artistry and Origins of India Raga Music alive. From the makers of Yoga Unveiled comes a visually beautiful Documentary that celebrates the artistry and origins of North Indian Classical Music. Raga Unveiled : 2 DVD Set. Shot in HD. Running Time 4 Hours. 20 Minutes. Format : NTSC and Pal. Compatible World Wide. Ravi Shankar, Samir Chatterjee, Ashwini Bhide, Amjad Ali Khan, Ashok Ranade, Birju Maharaj, Purbayan Chatterjee, Ali Akbar Khan, Aarti Anklikar, Zakir Hussain, Subhash Kak, Ajay Chakravarti, Tanmoy Bose, Rajan Mishra, VijayKichlu, Kumar Mukherjee, Lalitha Ubhaykar, Nayan Ghosh, Bismillah Khan, Kishan Maharaj, Shivkumar Sharma, Ustad Abdul Rashid Khan, Veena Sahasrabudhhe, Bhimsen Joshi, Swami Yogatmananda, Swapan Chaudhari, Subhra Guha, Sabina Islam, Rakesh Chaurasia, Ronu Majumdar, Ram Ashray Jha, Gangubai Hangal, Arvind Parikh, Gundecha Brothers, Prabha Atre, Bhawani Shankar, Dinkar Kaikini, Ahmed Jan Thirakhwa, Amir Khan, George Ruckert, Yogesh Samsi, Padma Talwalkar, Allaudin Khan, SCR Bhatt, Jayant Kaustur, Steve Gorn, Yogesh Samsi, Allah Rakha, Kushal Das, Subhankar Banerjee, Prabha Atre, Shashank, Sudha Raghunathan, Shujaat Khan, Amit Mukherjee, Sangeeta Katti Kulkarni, Tejendra Majumdar, Mansi Majumdar, Fahimuddin Dagar, Debhashish Bhattacharya, Dr. Satya Narayan Dasa, Manjri Asnare and Many More . . . Here, the fundamental understanding of pure sound as understood by the sages is expressed. Its primary purpose to attain Self Transcendence is covered. The meaning of raga and its grammar is clearly unfolded through the help of interviews, demos and beautiful and informative visual graphics. Many wonderful performances are also interspersed. followed by befitting demos and graphics. Its brilliance shines forth through the explanations and performance clips. The unique role of rhythm as an equal limb of Raga music is most articulately emphasized. All the different components of the Indian rhythmic system are laid out, followed by befitting demos and graphics. Its brilliance shines forth through the explanations and performance clips. The hallmark of the raga music being the ability to play or sing for unlimited time, is driven very clearly in this chapter. A fantastic example in the form of a 6 person ensemble making music on the spot is perhaps the highlight of this film ! The extraordinary system of oral transmission of knowledge from teacher to pupil, and all the subtle nuances of this relationship are covered. Some light is thrown on the system of schools or lineage within the vocal and instrumental genres. The ability to be able to perform for such lengths of time and improvise requires a certain extraordinary type of grooming and training system and dedication from the disciple and the guru. Here a glimpse of this is shown leading into how one prepares to become a performer. The journey of the older Dhrupad forms to the present Khyal singing is well explained. Some of the major light classical genres are illuminated. Wonderful renderings of each genre makes this chapter delightful to view. The classification of the instrumental categories are explained. Some unique aspects of Indian instruments are covered. A great tribute is paid to the instrument makers as well. Also covers a sweeping look at the cottage industries that create these exquisite instruments. Here, many great musicians voice their opinions on today's influences on the musical scene with some heartwarming pledges to keep this wonderful heritage alive. Cinematography : Malini Dasari, Gita Desai, Dean Batchelder, Samir Sarkar, Ron Michaud. info@ragaunveiled.com to go through the Protocol.